Too many people use the word ‘gay’ to describe something negatively – for example a person or situation they don’t like. But this doesn’t make sense, because although there are different definitions of the term, it’s not intended to be used in this way. My team and I feel that misusing the word ‘gay’ is a common form of homophobia that needs to be addressed. Even if a person doesn’t mean to cause offence, we think everyone ought to choose their words carefully. Alex Newton supported my project by providing an interview for the ITV News broadcast. Vikki Fold, Community Development Officer at Crawley Borough Council, has supported our Fix. She looks after the youth council and has worked with Fixers to help us coordinate our project. The team at the Thomas Bennett Youth Wing have backed our project. On Friday 18th July we delivered five workshops to a total of 68 pupils in years 7 to 10 at Thomas Bennett Community College’s Unique Day. 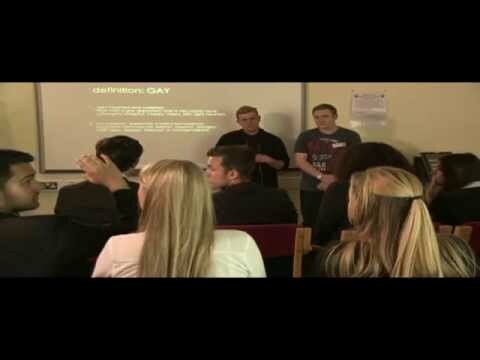 We showed our Fixers film and spoke to the students about how they use the word ‘gay’. They were very receptive and joined in with all our activities. We then asked participants to either pledge to make a difference going forward or to tell us what they had learnt from the workshops.